Since the start of the year, we have been delivering family-friendly courses predominantly in Mallorca. 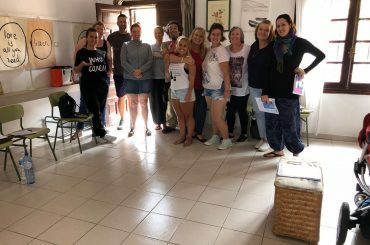 So we were delighted to get the call to visit and deliver community first aid training in Tenerife, specifically the Level 3 Award Emergency Paediatric First Aid course. We would like to thank the San Blas Centre in Golf Del Sur for allowing us to use their excellent facilities. We’d also like to thank Janet Anscombe for promoting the course via her website and media channels. For all things Tenerife-related, it’s worth visiting Janet’s page for all the latest news, information and advice. Since we first wrote about our community initiative in February, we have been (pleasantly) overwhelmed by the continued level of interest and enthusiasm for learning first aid. There are too many participants to name individually! But what we want to say to you all is: thank you. Your participation means that no matter where you are e.g. at home, work or within the community; you can help someone in need of first aid. Where next? We will keep you posted! If you’re a community group or venue and interested in arranging a session, please get in touch.